Up for an outdoor challenge that’ll reward you with panoramic views of London. Up at The O2 you’d be experiencing the same while getting an exhilarating view of the city. The safety measures taken to take you to the top are excellent. This being reason why standing 52 meters above ground level doesn’t seem all that scary. You have an instructor that will help you with the climb. The Up at The O2 is highly recommended when in London. The picturesque city offers one of its best views from here. Also, visit nearby attractions in the city which are covered in London itinerary 5 days. You cannot carry anything other than a phone or a camera with you during the climb. There are professional photographers here too. You must be over ten years old and at least 1.2 meter tall for the climb. Love this? Explore the entire list of places to visit in London before you plan your trip. Fancy a good night's sleep after a tiring day? Check out where to stay in London and book an accommodation of your choice. How popular is Up At The O2? 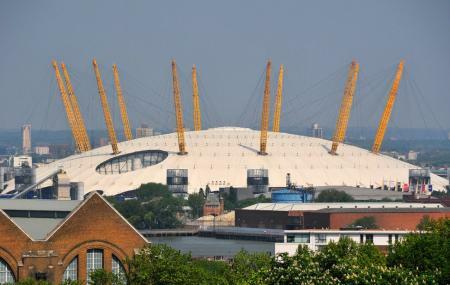 People normally club together Greenwich and Royal Opera House while planning their visit to Up At The O2. Amazing experience walking over The O2. At 69 it was now or never! But it was worth every penny! We had a very windy day but this just added to the excitement. It was like climbing a giant bouncy castle I felt like a kid again. Totally exhilarating, would recommend to everyone. The views were to die for and you get the opportunity at the top to take all the photos of London you want to. Really nice experience. Not a scary climb or an adrenaline rush experience, but more of a workout - climbing up and going down. Made a reservation for 7:30PM. I think they also admit walk-ins. They provided the shoes, and the overalls. It was quite cold and windy. I only wish that I had brought some gloves. Our guide Charles, was very helpful and he really made everyone feel confident/safe about climbing up and going down. No phones allowed during the climb, only at the top. The attire given has pockets for phones or cameras. Absolutely wonderful experience for people of any age, cannot recommend this experience enough with lovely staff who are supportive and entertaining full of facts and helpful tips. Our tour-guide (George) was extremely helpful and made this possibly frightful experience for some people into a wonderfully enjoyable activity, he even took some wonderful photos of me and the rest of my family. These photos top off this once in a lifetime experience which we will keep in our minds forever, 10/10! This was a great 90 minutes. You walk through to get harnessed up then make your way out to the stairs up to the start of the walk,the is a photographer snapping you before you start the walk. Your harness is attached to a cable all the time until you get to the top so no over taking people. It is quite steep at the start but gets easier. Once at the top you spend 20 mins taking in the views then head down the other side. There are toilets at the start and finish. Definitely worth doing.